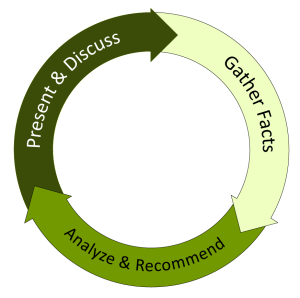 A typical Woodlawn project starts with establishing a fact base through research or interviews. Next, we analyze this data, synthesize it with what we know from past experience and our client’s objectives and constraints, and develop recommendations. Finally, we present our recommendations. We ardently believe clear presentation leads to good decisions—and often, better questions. Helped financial technology company develop a go-to-market strategy for direct and indirect sales channels. Evaluated size and growth of various industry segments, as well as the fit of the client’s product with those segments. Designed sales team structure, including roles and responsibilities of each position. Conducted analysis of U.S. solar industry for an international renewable energy company. Gathered primary and secondary research on market size, growth, pricing, and competitive environment. Led a comprehensive strategic evaluation of nine potential growth markets for a large commercial solar developer. Estimated market size, growth, and development risk. Evaluated fit with existing client resources. Recommended pursuing only three of the nine original markets. Advised wind turbine manufacturers on appropriate level of vertical integration, how to reduce fixed and working capital requirements, and perception by top wind farm developers in the U.S. Led large cross-functional teams to re-engineer processes for product launch, product life-cycle management, pricing, and agile software development for large electronics manufacturer. Advised solar PV module manufacturers on go-to-market strategy. Benchmarked other, mature industries with similarities to solar to determine how solar is likely to evolve. Counseled telecom operators on how to improve customer loyalty and marketing efficiency by modeling and predicting customer lifetime value and demand elasticity using predictors based on customers’ innate characteristics, purchase histories, and experiences.